Ok - I admit I had never heard of either of these characters ACE & Krypto when I was first asked to make this cake. BUT, I found a cheap superman and batman at Target that I used for cake toppers, drew the outline of the city and used stars to fill it in, printed pics of Krypto and Ace, and that's basically it! The bat symbol is a frozen buttercream transfer - just google that and it'll explain how to do it. You basically trace an image on wax paper, freeze it, fill it in, freeze it again, and then flip it onto the cake. This was for a 4 year old boy and he LOVED IT!!!! 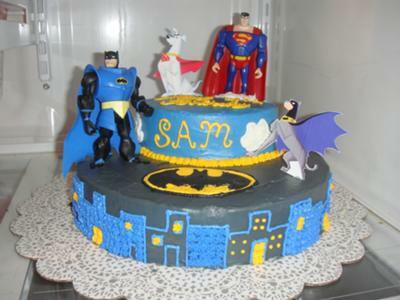 Thanks for posting- I'll be making a Batman cake soon for another (soon to be) 4 yr old named Sam, and I love this idea! Too cute! You did a great job!